Passover is my favorite time of year. It's traditionally been the one time where my whole family gathers together in Los Angeles for seders and togetherness, and it means that Spring has kicked into high gear. Andy and I are heading down to LA this week, and we have a lot on our agenda. Besides spending quality time with family and friends, I'm getting a 2nd opinion on my back (my neurosurgeon here wants to operate on my herniated disc), and we're celebrating 3 birthdays: my mother-in-law's, our dear friends' daughter's 1st, and my dearest Nana's 80th! She looks and acts like she's 50... let's hope I got some of those genes. I offered to help out with some seder preparations, but since we're flying down the day of the seder, I needed something I could make ahead of time and transport. 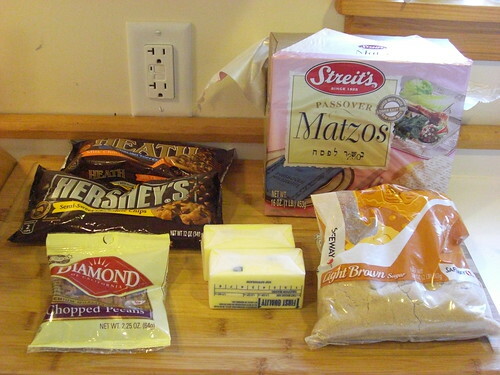 Enter chocolate toffee matzo. It's a family recipe that my mom got from a friend and I modified a bit, and it's impossible not to like. I'm planning on packing it with parchment paper in a tupperware-type container to transport it. Any other tips on flying with fragile baked goods? 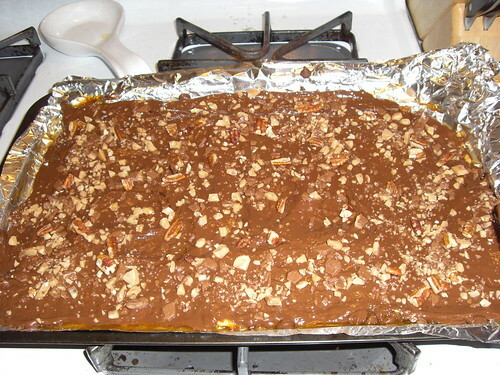 Note: Feel free to modify the amount of toffee pieces and pecans to taste, or to experiment with other toppings. Preheat oven to 450. 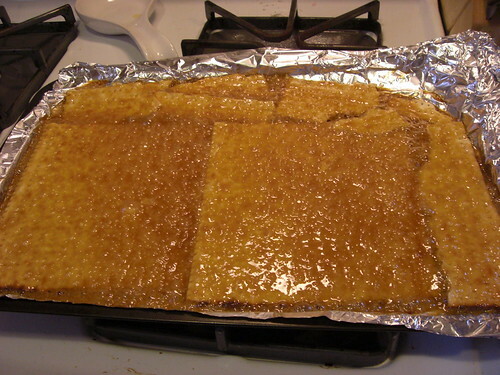 Line a jelly roll pan or rimmed baking sheet with foil. 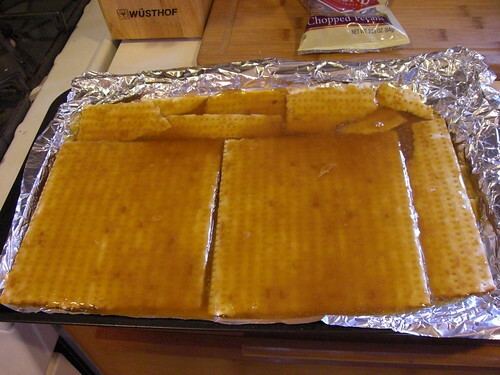 Fit matzos in 1 layer, covering entire pan. 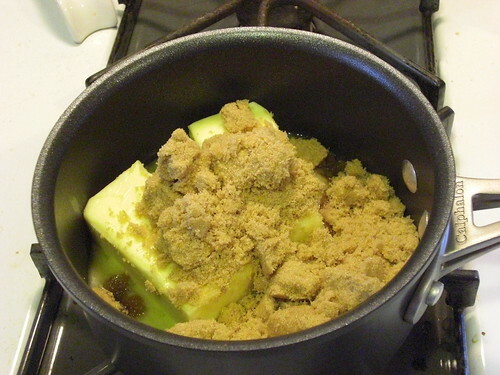 Melt butter and brown sugar in a small saucepan over medium heat. 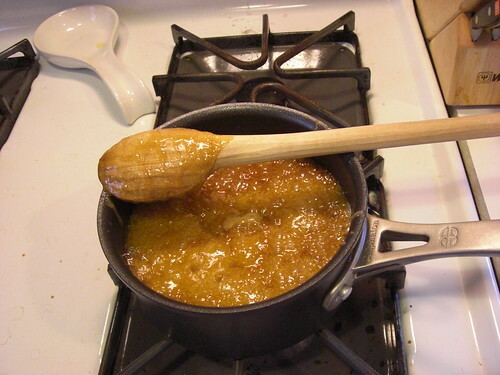 Once melted, boil for 3 minutes. Bake at 450 for 4 minutes. 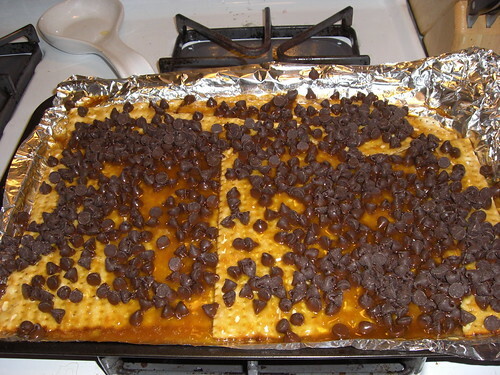 Remove from oven and sprinkle chocolate chips on top. Return to oven, bake for 1 minute. 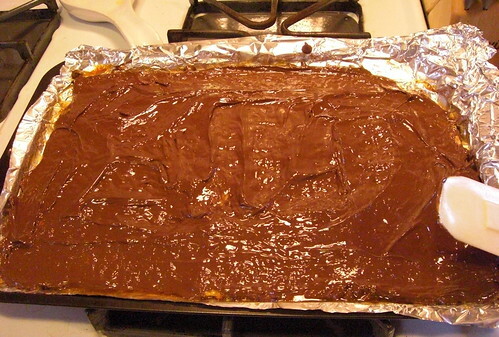 Remove from oven and use a spatula to gently spread melted chocolate to cover as completely as possible. 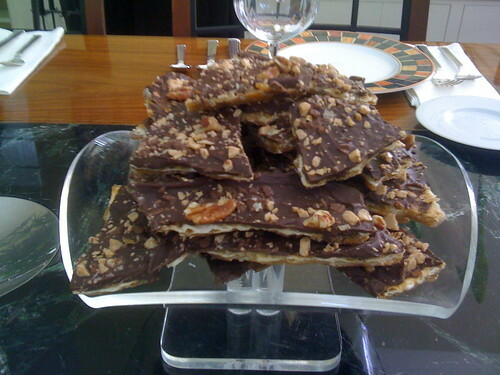 Sprinkle with toffee candy and chopped nuts. Cool completely. Break into pieces and store covered in the refrigerator. Edit: Here it is, ready to go on my uncle's beautiful table. As predicted, it was a huge hit! YAY YAY YAY!!! Passover is MY favorite time of year TOO!!!! 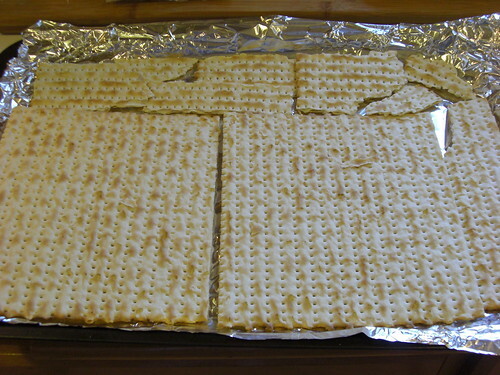 I am making this EXACT same thing for our seder! YAY!!!!! looks fantastic! I noticed your comment about herniated disc surgery. I have a very close friend who went through that eval process in Eugene. Would be happy to connect you with her. Drop me a line at ourhomeworkseugene at gmail dot com if you want.